What are you looking to get out of your countertop? 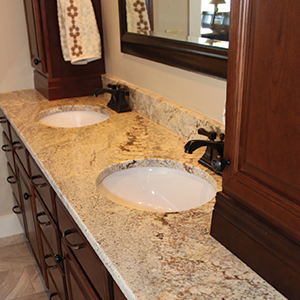 What you want to get out of your new kitchen or bathroom cabinet countertop determines which material is best for it. We’ll look at the pros and cons for the options in both rooms to help you narrow down your choices. 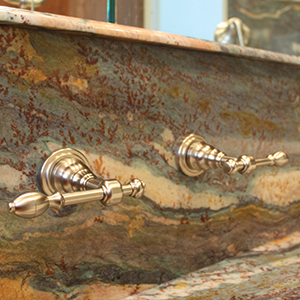 Still confused about what to choose for your bathroom or kitchen countertop? Many people in Nashville have come to us at Stone World to sort out which material is the right replacement for the kitchen or bathroom. Call up our design team and ask them any of your questions. You can also take a look around our kitchen gallery, or bathroom gallery, to find some inspiration. It’s no secret that people in Nashville love to cook outdoors. As more and more homes start to either have an outdoor kitchen built with them, or as people decide to add one during an expansion, design consideration must be given to the materials used. Granite has been used in outdoor kitchen design for countless years, you can choose to incorporate it into your theme as well. There is no getting around it – every outdoor kitchen theme in Nashville is going to have a big barbeque installation as the central element. In fact, many people choose the barbeque, and then choose the design! For a true outdoor kitchen, you’ll need to build kitchen countertop space around the barbecue itself. This is where granite really comes into its own in the design as it can withstand high amounts of heat for sustained periods of time – it can tolerate your all day cookout! If your design theme uses a big barbecue, or any other large and hot cooking surface, you need a granite countertop around it to resist warping and heat damage issues that are associated with lesser materials. The area around your barbecue isn’t the only place where granite can tie into themes for outdoor kitchens. Tables and other eating surfaces will benefit from being made of granite. This is because a properly sealed granite countertop or table is easy to clean – just soap and water. Think about how quickly plastic tables deteriorate in the heat of a summer in Nashville, and how dirt is ground into it: this won’t happen with granite. When laying down a granite tile for your outdoor kitchen, you can be sure that you’ll have a wide variety of color choices and extreme longevity. Having a granite countertop and a brick patio can be a contrasting look that makes your home look disjointed, use similar materials to give your home consistency throughout. Which granite countertop or tile is right for your outdoor kitchen? Our team at Stone World is ready to help anyone in Nashville, or the surrounding Tennessee area, choose the right pieces of granite for their outdoor kitchen. Our experts have lead homeowners down the path to a perfect outdoor kitchen in the past, with a strong design theme, and they can do this for you as well. Choosing the ideal colors for your outdoor kitchen countertop or bar is about a lot more than determining how big your fridge should be. There are considerable design elements to consider when you start looking at how you’re going to complete your outdoor space. We’ll look at some popular color schemes featured on homes in Nashville, and suggest the stone which will work best in your outdoor spaces. The easiest way to select a stone for your outdoor kitchen countertop is to choose colors that coordinate perfectly with the colors of the outside of the home. If you have chosen a gray exterior for your home, choosing stones which feature primarily grey tones will be best. For an actual example of a grey stone to use for patio kitchens and outdoor bars and countertops, try out our own Silver Silk from our granite collection, or see our Istmo from our quartz collection. Keep in mind that ‘monochromatic’ doesn’t have to mean one color only, you can have varying shades of grey which work together to create an interesting and dynamic look. A consistent look to your outdoor living space can be created through choosing contrasting colors. A very light stone, such as Helix from our quartz collection, or African Zambesi from our granite collection, can contrast perfectly with your dark home. The flipside is just as easy to look at. Our dark Absolute Black will look striking next to your lightly colored siding. Choosing colors that are on the opposite side of the color spectrum can be done, but it must be done with caution. Most stone is, as you’d expect, a more natural color, but the right shade to contrast your siding can be found. Contact us at Stone World for precise advice on this stylistic decision. This is when you choose colors which are next to one another on the color wheel. The most common way that homeowners in Nashville do this is with the red, yellow and orange schemes. A home which has red brick siding can feature a stone like our own Sunset Gold for the outdoor kitchen countertop. You’ll create a truly memorable look if you combine the red of the brick with the yellow of the granite, adding a touch of orange completes the look. For help planning your outdoor kitchen countertop color choices, and choosing the actual slab you’ll purchase, contact us at Stone World. Our location in Nashville is ready to help you with all of your color choices. When you start building outdoor living spaces in Nashville, for your BBQs with friends, or for your lazy weekends, you have to consider using long lasting building materials. An outdoor living space demands something beyond laminate, this is why many homeowners turn to granite countertops for their outdoor kitchen. When home design experts start planning for a long lasting outdoor cooking space, they choose granite countertops. This is for a good reason: granite was forged in the depths of volcanic activity – it can handle many Nashville summers without a problem! The strength of a granite countertop isn’t limited to how long it will physically last, it is also related to the little things. The strength of granite countertops helps to keep them from scratching, chipping, or staining. Not only do they last for years, but they look great for years. In order to actually break one you’ll have to drop something on it that is much heavier than anything you’d actually ever want to put on a countertop! A properly sealed granite countertop also works well in an outdoor environment due to how it repels water when it has been properly sealed. A big problem with materials that are used outdoors is how water can expand and contract it, over and over again, slowly tearing it apart. Try using any sort of laminate and plywood countertop outdoors, it will quickly deteriorate. 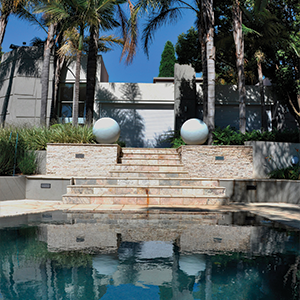 Stepping aside from the practical aspects of granite, design wise it can’t be beat. 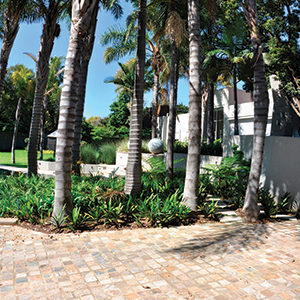 Granite is a natural element, using it outdoors makes your outdoor space feel natural. Why build an indoor style kitchen outside when you’re trying to be outside and more in touch with nature? A granite countertop can be just the material you need to get that outdoor feeling. For examples of outdoor living with granite here in Nashville, take a look through our catalogue. If you don’t see something you love, contact us and we’ll be able to help you further. Upgrading your kitchen countertops from laminate to granite is a wise decision. Laminate kitchen countertops have never been the first choice of homeowners in Nashville, most people choose it for short term savings that come back to bite them in the long run. Granite countertops are long lasting, look amazing, and keep their beauty for years to come. I’ll look at the reasons why laminate is an inferior choice for your kitchen countertop, and explore the benefits of granite countertops further. It is prone to showing scratches. Laminate can burn when a hot pan or pot is placed on it. Stains on laminate are common and frequent. Moisture exposure can cause the layers to begin to peel back. With all of the sharp knives around that can cause scratches, hot pans that can burn it, sauces and juices that can stain it, and excess moisture from spills that warp it and cause peeling, it’s a wonder that laminate works as a kitchen countertop at all! Granite is forged in the heat and pressure of volcanic activity, making it extremely resistant to heat. The dense nature of granite keeps it scratch free. The unique beauty of granite was made by the most famous decorator – Mother Nature! Your granite countertop will be different than any other kitchen countertop in Nashville. Granite is nearly impossible to break – you’ll have to hit it very hard to even dent it – this isn’t the case for laminate. Properly sealed granite can withstand stains and water with ease. A good granite countertop will withstand warping and burning when hot pans are placed on it, have a completely unique look, be nearly impossible to scratch or chip, not break easily, and it will resist staining from common spills. It’s the perfect kitchen countertop material. Where to find quality granite countertops in Nashville? 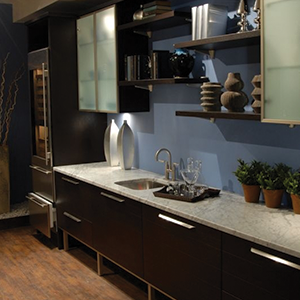 Your closest granite countertop supplier in the Middle Tennessee area is us, Stone World! Our team has helped countless homeowners in the area upgrade their kitchen countertops from laminate to granite. Learn how granite updates your kitchen and contact us for advice that will find you the ideal solution for your design ideas. Getting the most value for your home in Nashville comes down to using long lasting materials. Choosing materials which have a short lifespan is a disadvantage when it comes to value. Either you, or the person looking to purchase your home, will have to remodel later on, decreasing value in both instances. Choosing a granite countertop, for your bathroom or kitchen, is one of the most valuable updates for Your home that you could invest in. It is the choice that you can make right now which will pay off later, all while allowing you to use it as you wish during the time you live in your home. Characteristics which lend themselves well to both design and practicality is a specialty of a granite countertop. Choosing one during a renovation, or as you build your new home, will save you money over the years as you don’t have to replace your countertop repeatedly. This will add value to your home if you choose to sell later on as potential homeowners know that they will not have to install a new countertop any time soon. For help choosing the right granite countertop for your home in Nashville, contact us at Stone World today. Our team of granite experts will be able to help you choose just the right slab for your granite countertop so that you experience the maximum amount of value for your home. Does Your Kitchen Need a Nook? Bigger isn’t always better in the kitchen design world. In fact, many people in Nashville that are looking to renovate their kitchen are turning to cozy little kitchen nooks to add some intimacy and warmth to their kitchen. This warmth and intimacy can come in awful handy on a Monday morning! The most popular place to put a little kitchen nook is right inside the space of a big bay window. This is actually one of the most popular additions put on a house as it doesn’t take too much effort to add a bay window, yet it creates so much space while also adding incredible lighting. In a currently empty corner of your kitchen. Remember that the point of a kitchen nook is to create a small and intimate area, a corner will help create this cozy feeling. Out in an adjoining sunroom is another popular choice. There isn’t anything that beats some warm sunshine on a morning when you’d rather be in bed, instead of getting ready for work. Between a wall and an island or kitchen countertop. Kitchens which have dead spaces in them, where no one really hangs out because there’s nothing interesting there, are common renovation areas for kitchen nooks. Having a kitchen countertop on one side, and a wall on the other, creates that cozy feeling that a kitchen nook should have. You want to create a warm and inviting feeling in your kitchen nook, and you want it to feel connected to your overall kitchen design. Many people choose to incorporate their kitchen countertops as part of their kitchen nook table tops. With the incredible popularity of granite countertops in Nashville, it’s no wonder that so many kitchen nook table tops wind up being granite as well. There are a plethora of warm colors available when you choose granite for your kitchen countertop and kitchen nook table. Does Your Kitchen Need a Nook? 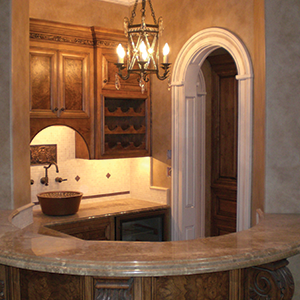 Contact us at Stone World today for advice on your kitchen nook ideas. Our design team in Nashville is ready to help you perfect your plans, and then put them in motion.